Sucharita Datta, daughter of Shri. 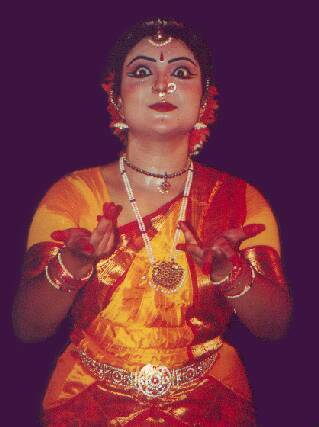 Swapan Kumar Datta had her training in Bharatanatyam and Kathakali under Guru Kalamandalam Venkitt from Uma Kalalayam. Ms. Sucharita wants to take Dance as her career and devotes most of her time to achieve her ambition. She has also learnt Kathak under Guru Amita Dutta. Ms. Sucharita performed Bharatanatyam, Kathakali and Kathak, solo and in-groups throughout West Bengal including Kolkata and other parts of India, Eastern Region in particular. She stood first in many competitions and won several prizes and awards for her performance in Bharatanatyam and Kathak from the West Bengal Music Academy, Dover Lane Music Conference, and from Dance Group Federation. Ms. Sucharita has performed in major Dance Festivals such as Uday Shankar Festival of Dance, Young Talents Festival organized by West Bengal Sate Music Academy, Kathak Nrityotsav organized by the Government of West Bengal and Eastern Zonal Cultural Centre, Nivedita Centenary Festival, Music and Dance Festival of 'DAMARU', Biswa Banga Sammelan and Rajasthan State Music Academy etc. Ms. Sucharita stood 1st Class First in Pre-degree Exam in Dance and she is doing her B.A (1st Year) in Dance in the Rabindra Bharati University, Kolkata.